You shall love your neighbor as yourself. Whatever you wish that men would do to you, do so to them. Not one of you is a believer until he loves for his brother what he loves for himself. A man should wander about treating all creatures as he himself would be treated. Try your best to treat others as you would wish to be treated yourself, and you will find that this is the shortest way to benevolence. One going to take a pointed stick to pinch a baby bird should first try it on himself to feel how it hurts. Comparing oneself to others in such terms as "Just as I am so are they, just as they are so am I," he should neither kill nor cause others to kill. One should not behave towards others in a way which is disagreeable to oneself. This is the essence of morality. All other activities are due to selfish desire. The City of Birmingham, Alabama purchased 21.5 acres for $1,073.50 in 1873 for a city cemetery—known as Oak Hill Cemetery. Many complained the site was too far from town, but Birmingham’s city center quickly expanded to the southern border of the cemetery. Birmingham came into existence through the creation of the Elyton Land Company, and of the ten original owners whose land made up the city, nine are buried in Oak Hill Cemetery. The cornerstone of Saint Patrick’s Cathedral was laid in 1858, but work on the building was suspended during the Civil War. Construction started again in 1865. John Cardinal McCloskey, the first American Cardinal, opened the doors in May, 1879. Everyday hugh crowds pass by and through Saint Patrick’s Cathedral on Fifth Avenue between 50th and 51st street, but when the cornerstone was laid—the location was far outside the city in the wilderness. In 1891 the First Baptist Church of City of New York moved into its fourth, and current, church building at 79th and Broadway. The First Baptist Church of City of New York was established in 1745. The church’s original building was on Gold Street, which was destroyed by the British during the American Revolution. A second building was built later on Broom Street down in SOHO. The third church building was located at Park Avenue and 39th Street. One of its pastors was a founder of Brown University, and two served as chaplains to the Congress of the United States. In 1832, Virginia planters came to the Alabama Territory and settled in an area that is now part of Talladega, Alabama. The settlers founded the Alpine Baptist Church, now the oldest church in continuous service in Talladega County. In 1872, the colonial wood frame building was moved its present site. To step inside is to take a step back in history. The antique clear clear glass windows, high ceilings, green shutters, and calm quiet give the visitor a feeling of being in a special place. A place where everybody is somebody. Alpine Baptist Church is a member of the Coosa River Baptist Association, comprised of sixty-seven (67) cooperating churches. The Coosa River Baptist Association partners with the Alabama Baptist Convention and the Southern Baptist Convention. Birmingham, Alabama St. Elias Parish was created in 1910. St. Elias Maronite Church belongs to the Maronite Rite, which evolved from the Antiochene Tradition of Catholicism. The Maronite Rite is named after the holy hermit known as Maron, who lived in the 4th and 5th centuries near Antioch, in Northern Syria. Maron was s steadfast defender of the Catholic faith. In the 7th century, the Maronite Church became a formal entity. The Maronite Church is one of twenty-two churches within the one universal Catholic Church, and obeys all the rules and ordinances issued by the Pope in the Vatican. The liturgical language used in the Maronite Mass is Syriac-Aramaic, the language spoken by Jesus Christ. Birmingham, Alabama St. Mary's on-the-Highlands Episcopal Church was established on February 11, 1887 when Grover Cleveland was in his first term as President of the United States. Electric lights were still a novelty, but horse drawn street cars from downtown to the top of the hill created the first Birmingham suburb: the Town of Highlands. The original buildings, along with other material things, have disappeared. Yet, St. Mary's on-the-Highlands Episcopal Church continues to grace the heart of the Five Points South neighborhood. Saint George Melkite Greek Catholic Church—Birmingham, Alabama The church was formed in 1921 by the Society of St George and met at 9th Ave and 13th Street South until relocating to the present site in 1959. Aldersgate began as The Eleventh Avenue United Methodist Church in 1902 in Birmingham's historic "Southside". By the late 1980's, the University of Alabama at Birmingham had expanded throughout Southside, boxing in the church property. In 1991, the family congregation relocated to Lakeshore Parkway and became the Aldersgate United Methodist Church. The church organized in 1820 and met in a log building until 1902 when J. D. McCampbell built a proper church building in 115 days for $115. McCampbell then became the congregation’s preacher for many years. The two front door design was common in the 1800’s. The two doors allowed men to enter one door and sit on one side and women and children on to do the same on the other side. However, it is reported the Cades Cove Methodist congregation was less formal and sat where they pleased. The entire temple was constructed without nails, and is a scale replica of a temple in Uji, Japan, built over 950 years ago. Kanetru-ki-do, the bell house, contains a three ton, five foot high brass bell called bon-sho, meaning sacred bell. The tone of the bell sounds a message of deep calm and peace, cleansing the mind of evil and temptation. The Byodo-In Temple is a non-denominational Buddhist temple which welcomes people of all faiths to worship, meditate or simply appreciate its beauty. 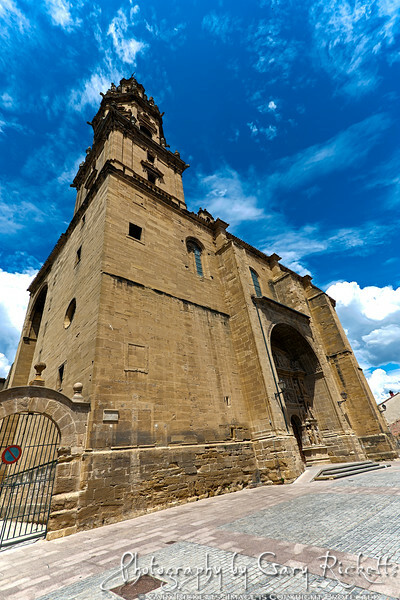 Autonomous Community of La Rioja, Spain Construction of the Monastery of Yuso began in 1030 when Sancho el Mayor, reinventing the pilgrim path of Santiago, ordered Saint Millán’s relics be put on display to encourage prayer. The construction of a new monastery at Yuso was because of a lack of space left available at the Monastery of Suso at the top of the adjacent hill. The first literature produced in Castilian, from which Spanish is derived, was produced at Suso. In the early 16th century the community moved into the fine new monastery of Yuso, below the older complex, and today continues as a thriving community. Built in 1846, Trinity Church is Manhattan's oldest public building in continuous use. When consecrated on Ascension Day May 1, 1846, the soaring spire, surmounted by a gilded cross, dominated the skyline of lower Manhattan. Trinity Church stood as a welcoming beacon to ships sailing into New York Harbor. Alexander Hamilton is buried in the Trinity Church cemetery, having been killed in an infamous duel with Vice President Aaron Burr. Robert Fulton is also buried in the same cemetery. On September 11, 2001, as people sought relief from the dust cloud inside the church, debris from the collapse of the first tower of the World Trade Center felled a century old sycamore tree in the churchyard of St. Paul's Chapel, a few blocks north of Trinity Church. Birmingham, Alabama St. Andrews Episcopal Church first began as a mission of the Church of the Advent in 1902, and was recognized as a parish by the Diocese in 1906. In 1913, three days before Easter, the church building was destroyed by a tornado. The cornerstone for a new church, at its present location, was laid on November 30, 1913. The building was finished and consecrated on All Hallow’s Eve in 1920. The picturesque brownstone church continues to grace the corner of 11th Avenue and 12th Street South. In 1887, Father James A. Meurer was assigned to establish a parish for German-speaking workers in Birmingham, Alabama. Father Meurer built the first Our Lady of Sorrows church, where he served until his death in 1906. Following Father Meurer’s death, Father Louis H. Galland became pastor of Our Lady of Sorrows, and continued the tradition of preaching in both English and German. The origin of the name of the church comes from the Sevite friars who were devoted to the sufferings of Mary. In 1668, the friars were granted a feast to be held on the third Sunday in September, known as the Feast of Our Lady of Sorrows or as the Feast of the Seven Sorrows of the Blessed Virgin Mary. Father James Meurer was not a member of any order, and it is not clear how the name, Our Lady of Sorrows, was chosen for the parish. Highlands United Methodist Church—Birmingham, Alabama In 1903, four women, Mrs. J.S. Gillespy, Mrs. R Eubank, Mrs. Edward Campbell and Mrs. Cunningham Wilson, invited the Rev. John D. Simpson, presiding elder of the Birmingham District of the Methodist Episcopal Church South, to tea to discuss the need for a Methodist Sunday School in their neighborhood. Not only did a Sunday School get started, prayer meetings were organized each Wednesday evening. So successful were these endeavors, the Five Points Methodist Episcopal Church, South was officially organized with a charter membership of 183 people on December 2, 1903. The four women, having invited the Rev. John D. Simpson to tea, would unlikely dream such a magnificent structure would be the result of their conversation. In Cades Cove, The Feezell family were prominent supporters of the Methodist Church. William A. “Billie” Feezell deeded land to the church in 1874 which provided a site for the cemetery. The Cades Cove Methodist cemetery has at least one hundred graves and is the second oldest cemetery in Cades Cove. During the early nineteenth century, the Methodist Episcopal church had significant gain in membership in the United States. By 1820, the church was the largest Protestant denomination in the country. The swift growth of Methodism was largely due to the theology it preached—individual responsibility and the equality of all men in the sight of God.